Take your own 3-D selfie with a short video and view it without 3-D glasses. Optimized for the iPhone 5. (Glendale, CA, September 3, 2014) HinesLab, Inc. of Glendale, CA introduces Popix3D, a three-dimensional photo app optimized for iPhone5 and iPad. Designed to be user-friendly and offer on-the-spot editing, Popix3D represents the first iOS product offered by HinesLab, well known developers of 3-D photographic equipment, miniaturized cameras and auto-stereoscopic 3-D displays. When the iPhone is rotated, the subject seems to protrude from the screen. By simply turning your phone the 3-D headshot appears to protrude out from the screen. The app uses video to capture head rotation and then displays it for easy hands-on editing. The photos can be shared using email, Facebook or Twitter. The Popix3D app uses the front or back camera with a merge option for headshots and a variety of fun add-on costume props and 3-D effects. The front camera captures headshots that rotate from side to side. A chroma-key technique using the back camera is provided for advertisers to photograph products such as clothes, jewelry, hats and other apparel. It is ideal for advertisers to promote their merchandise. App users can try on items virtually. From a link on advertisers’ websites, customers can download the Popix3D image of the merchandise and combine it with their headshots. The headshot app can be downloaded at the Apple app store for $1.99. Orders for stereoscopic 3-D postcards-like prints created from any Popix3D picture can also be purchased in the app. Click on images to send the Popix3D picture to your iOS device. Brooke B. Malerie L. Caryn S.
Headshots can be shared with friends using Facebook, Twitter or email. Take your own Popix3D photo. Hold the iPhone or iPad against a window or wall. Use the app to shoot a video while turning. Full instructions are provided with the app. Click on images on to send Popix3D files by email to combine with a headshot. You can merge multiple add on's, for example add the crown, then bug eyes. A chroma-key photographic technique using the back camera, is provided for advertisers to photograph clothes, jewelry, hats, scarves, etc. to post on their website, for app users to download and combine with their head shot to see what they would look like wearing the item. App leaves product on transparent background, to be used on the advertiser’s website for download by a Popix3D app user. User selects a head shot, which appears in the background, and pinches the head shot to match the scale of the clothes. When merged, the images rotate together as if the user is wearing the clothes. Product photography on chroma-key mannequin head. App places product on transparent background for advertiser's website. User downloads the product ad and merges it with a headshot. HinesLab can create an ad for your product. Please contact Steve Hines for advertising rates. Popix3D shots can be taken of newborns right in the bassinet and be emailed to the admiring father on the other side of the window, who can then share it with grandparents and friends at the office. Popix3D can provide photos for the student and parents. School principals can keep a visual record of students on their iPhone, iPad and computer that can be forwarded to the authorities in an emergency. When MRI and cat cans are converted to the Popix3D format, the files can be shared with other doctors confidentially. Unlike conventional police mug shots from the front and one side, Popix3D pictures provide natural look around to reveal identifying scars or tattoos. 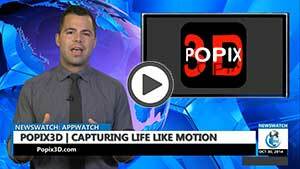 Popix3D shots can be sent confidentially. 4×6-inch 3-D lenticular photos, like 3-D postcards, can be made from any Popix3D picture and provide stereoscopic 3D and motion parallax. Individual orders are no longer available, however volume orders, for promotion and product advertising, are available through this site. • "This is really AMAZING! ", name not provided. • "Pretty neat", ★★★★★ by Nickdagamer – June 22, 2013. You can take a vdeo of your face fairly easily and by simply rotating your phone, it will cycle through the video that you took. I think this could be the basic first look at the new 3D Parallax effect in iOS 7. Nicely done. Could use a lot more models, people and 3D. • "Great App, never seen smth like this", ★★★★★. This app will be great in online stores where you can wear smth before buying. Coool, Alik R., Glendale, CA.